ALL inventory is fragile when you consider the cost and value it brings to your business. But when the product is an egg… well, we can all appreciate the delicate balance that’s imperative to its storage and handling. 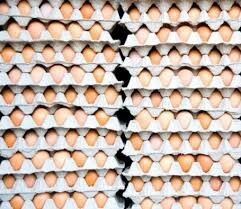 Mallard’s heavy duty pallet flow racking system is the perfect FIFO storage medium for this fragile food item – proven in our in-house testing lab where our engineers went to great lengths to create an authentic test simulation using a variety of pallets with both boxed and loose egg cartons. 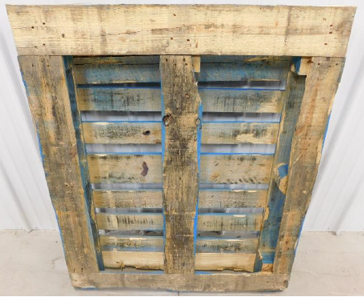 12 sample pallets were provided to serve as a good representation of what was being used in their warehouse, including; CHEP with full-length bottom runners and standard GMA style pallets. Both sample types were 40”x48” wood pallets, approx. 72” high when loaded. It’s always good to test all pallet types to ensure “flowability” and to identify pluses or minuses of the pallet types which can assist in increasing efficiencies. Our 30’ pallet flow rack lane was set-up with three rails of durable polycarbonate wheels on 3”-2”-3” centers. Drop-in speed controllers were placed at 56” intervals which we found was sufficient to control both the speed of the ascending pallet and the tracking down-lane. Overall, testing went very well on this pallet flow system. 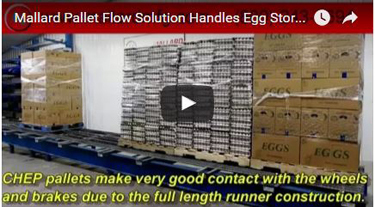 Both loose wrapped and boxed egg pallet loads flowed flowed well in this system design. Our engineers have cautioned the customer, however, that overhang could result in difficulties removing pallets from the system. Pallets moved smoothly and controlled during test with only one minor delay in restarting rear pallets after a front pallet was removed. The pallets started back up on their own, but a simple plugging would be all that was needed if they hadn’t. Overhang of product on pallets should be kept to a minimum if possible. Compromised pallets should be taken out of rotation & fixed. Missing boards could result in excess speed or load stability. CHEP Pallets with full length runners tested slightly better than GMA with mixed sized front, back and middle boards. #40 drop-in speed controllers and a 3/8” pitch worked to keep smooth flow for the pallets tested. What fragile inventory are you moving in your warehouse? Let us help you design a smooth, efficient pallet flow system to protect your valuable commodity while saving space and improving productivity. Give us a call and we’ll do our best!